The main dining venue is the Rotterdam Dining Room (Decks 4 and 5), a two story aft-facing room with windows on three sides. This dining room serves three meals each day: an open seating breakfast from 8 - 9:30 a.m.; open seating lunch from noon to 1 p.m.; and dinner. In the evening, Holland America Line's As You Wish Dining enables passengers on Zaandam (and all other Holland America ships) to opt for pre-set seating and dining time -- or take advantage of a new, flexible option (breakfast and lunch are already open seating). One level of the ship's two-deck-high dining rooms will be dedicated to traditional "early or main seating" (usually 6 p.m. and 8:15 p.m. though times could vary based on itineraries) while the other will be open from 5:15 - 9 p.m. daily. Passengers who choose the flexible option can make reservations ahead of time -- or simply walk in. The Rotterdam Dining Room has many tables for two, four and six and also a number of larger tables. At dinner, the menu offers starters, soups and salads, and entrees. There are vegetarian and some healthy items, but they are not separated on the menu. A separate menu lists desserts, some of which are sugar and/or fat free. Coffee, decaffeinated coffee and tea are served at the table, as are espresso and cappuccino (regular and decaffeinated). Portions are moderate, so diners can expect to order several courses. The Rotterdam also boasts a vegetarian-only menu for lunch and dinner; it consists of appetizers, salads, soups and entrees. Options include dishes like portobello mushroom and chipotle quesadillas, Vietnamese vegetable spring rolls or spicy lentil and garbanzo salad. The preparation is well executed and the food attractively presented. Service depends on your server -- some are better than others -- and there are some problems communicating with stewards whose native language is not English. At breakfast, on the other hand, service was excellent, the table sparkled and the food came freshly prepared. Breakfast is open seating. There is a Lido Restaurant (Deck 8) that serves coffee and tea 24 hours a day and is open for meals: breakfast from 6:30 to 10:30 a.m. (Continental only from 6:30 to 7:00 a.m. and after 10 a.m.); lunch from 11:30 a.m. to 5 p.m. (entrees only until 2 p.m.); and dinner from 6 to 7:30 p.m.
We ate breakfast, lunch and dinner in the Lido Restaurant. There are serving stations to cut down on lines, and these include Asian and Italian stations, along with a sandwich bar. Desserts and a salad bar are separated from other courses. At the end of the buffet line stands a steward to take the tray and seat the diner. Roving bar waiters take drink orders. At breakfast there are separate egg and waffle stations. Juices, fruit and cereal are separated from other courses. The breakfast offerings are more plentiful than room service. There is an outdoor cafe called the Terrace Grill (Deck 8), open from 11:30 A.M. to 5 P.M. with tacos, hamburgers, hotdogs, veggie burgers and grilled chicken. 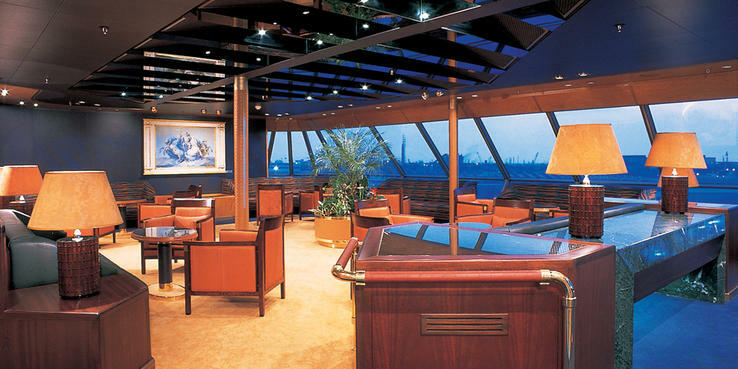 The Pinnacle Grill(Deck 4) is the ship's extra tariff restaurant. Open for lunch and dinner ($10 service charge for lunch, $35 for dinner), it offers a Northwest menu with Pacific Rim appetizers and salads, grilled aged beef, lamb, salmon and chicken and comfort food desserts. We ate lunch and dinner in the Pinnacle Grill. The restaurant is an interior space with views of passengers walking past and peering in. Service is mechanical. At dinner we ordered a delicious Thai soup and a small filet mignon, which was excellent and cooked just as I'd ordered it (rare). Alas, these were the high points. For instance, we ordered cheese, which arrived plated and stone cold. When I mentioned to the restaurant captain that the cheese should be room temperature, she took note. She returned later to say the chef agreed with me (how affirming for me! ), but United States Public Health required that the cheese be kept in the refrigerator. Most wines on the Pinnacle Grill list hewed to its theme and were from Washington -- but there was a separate list of very expensive wines ($100 to over $500/bottle) that included choices from California and France. There is free 24-hour room service with sandwiches, salads and simple desserts available all the time and breakfast and dinner entrees during restaurant meal times. Passengers wanting to order room service breakfast place a card on their door, indicating a half-hour window during which they want it delivered. The menu features hot and cold items, and my experience was good: Everything we ordered was on the tray, and it arrived on time.